Sour coffee to start the day! So you know when you go to a beer festival and get a little inebriated and buy a t-shirt? 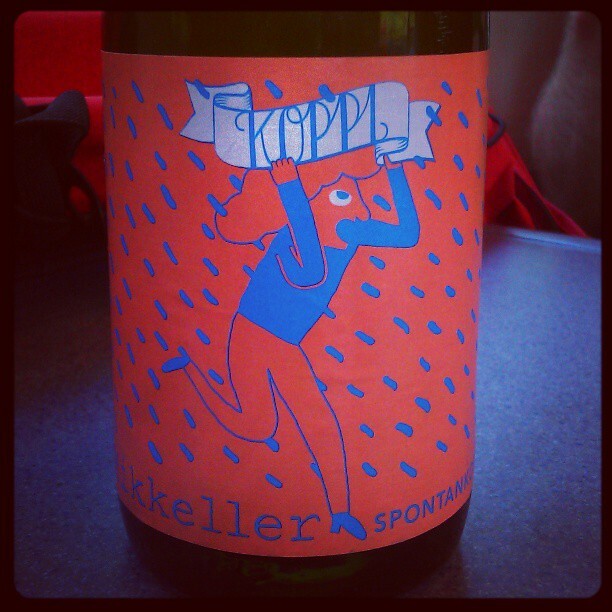 Yeah I ended up leaving the Copenhagen Beer Celebration with a t-shirt of a beer I hadn’t actually ever tried, Spontankoppi, based on the fact that the picture was pretty cute and the assumption that I could buy a bottle at the Mikkeller bottle shop. Unfortunately I hadn’t actually figured out that the hundreds of other beer freaks from around the world who had come for the festival would also be looking to pick up a bottle or two to take home so the shop was pretty much ransacked by the time I got there and all the Spontankoppi had gone. Thankfully, I managed to pick some up back in the UK at my lovely local beer emporium, Bitter Virtue. The Spontan series is Mikkeller’s series of lambics which are ‘spontaneously fermented’ using wild yeast and includes lychee, blueberry and strawberry variations. Fruit lambics…so far so good but coffee!? Doesn’t coffee traditionally go into stouts and porters? Not any more! As far as I am aware, this is the only coffee lambic in existence but let me know if you hear otherwise. As regular readers may have noticed, I prefer to enjoy my coffee beers on weekend train journeys as a little kick-start to the day. Unfortunately, since I hadn’t brought a glass, I swigged this one straight from the bottle (poor form I know) which meant I couldn’t really get a good whiff at the aroma so I was completely unprepared for the flavor! Having tried several from this series, I should have known what to expect but the shocking sourness hits me every time and I end up contorting my face like a lunatic with the first sip. To be fair I was drinking just before 11am so maybe I was still waking up. Getting past the extreme geuze-like super-sour hit at the front, the coffee tasted fresh and green – my first thought was that unroasted beans had been used but apparently the beans were roasted but unwashed when they went in. The bright but bitter super-carbonated-ness really brought out the acidity of the coffee in a unique way and the dry slightly sour-grape finish reminded me of a lively champagne. I’m pretty confident that this is my favorite of the Spontan series so far – a superbly refreshing way to take your morning coffee!